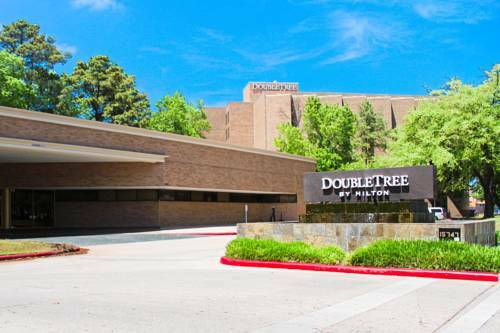 Our newly renovated Doubletree Hotel Houston Intercontinental Airport near George Bush Intercontinental Airport /IAH/ offers complimentary airport shuttle service and is only one mile away from IAH. Our hotel features 313 completely renovated elegantly appointed guest rooms accommodations and suites that include the Sweet Dreams bedding package high-speed Internet access oversized work area a sitting area and other modern in-room conveniences. as well as our first-rate hotel services and amenities. We also have 18 500 square feet of meeting space and banquet rooms available and can provide elegant professional catering services to help make your next Houston business meeting or social event come alive. Whether your stay in Houston Texas includes business or pleasure our friendly and professional hotel staff looks forward to welcoming you with our Doubletree signature warm chocolate chip cookie upon check-in. We proudly brew Starbucks Coffee. Enjoy specialty coffee drinks and a variety of breakfast and snack items. Located in the lobby. Enjoy a delicious selection of entrees ranging from the classics to regional favorites. For a lighter option try the Doubletree Eat Right Menu.